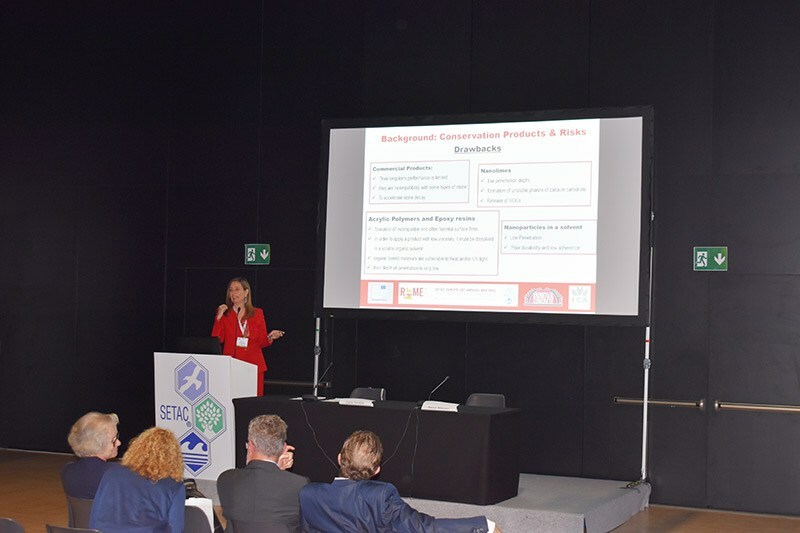 The InnovaConcrete project has been presented in the SETAC Europe 28th Annual Meeting on the 14th of May in Rome. The Project Coordinator, Maria J. Mosquera, gave a lecture about “Nanotechnologies for the conservation and connected risk” where she explained how nanomaterials and the InnovaConcrete innovative techniques could significantly improve the conservation of Cultural Heritage. In this Special Session named “Safeguard and Conservation of Cultural Heritage: the contribution of chemistry”, chaired by Lucia Toniolo and Rocco Mazzeo, also participated prestigious experts in the field of H2020 Cultural Heritage projects, such as Cristina Sabbioni (CNR-ISAC -Istituto di Scienze dell’Atmosfera e del Clima) and Luca Pezzati (CNR-Istituto Nazionale di Ottica).